Hotter, Colder–It’s Still Your Fault! "The red pigments are the sunscreen and drought stress protective pigments they produce to protect themselves – antioxidant and UV screening compounds. ← The World’s First Solar Panel Road- Not Such A Bright Idea After All! This’ll be the land based equivalent of the Great barrier Reef coral then. They might also weigh this up against the planets 14% greening over the last 35 years of satellite observations. Two continents the size of mainland USA according to one of the authors of the NASA study. But that’s inconsequential in the face of moss on an entirely useless, frozen continent. Damn! done it again…..that should be HotScot. Yup my fault, can’t get away from it. I always knew it really, but I guess I was in denial. And of course, the Antarctic ozone depletion is seasonal and very temporary. Are you sure they haven’t misinterpreted the absence of rainfall data as the absence of rain! Or (and here’s a thought) this could be something to do with a process we so-called ecologists know as “succession” whereby pioneer species give way to more competitive kinds over time, even in the absence of abiotic change in the habitat. No worries! Corbyn is gong to double wind generation and triple solar so that we shall be 60% renewable when he is in power (hopefully not solar power as he will only be running the country 11% of the time). That way, global warming will be conquered by the glorious Social Revolution that he will bring about. Renewables will save Arctic Moss. (But SC 24 may have more to do with it). Not only that, but he is going to create hundreds of thousands of new green jobs presumably for more new immigrants as we already have close to full employment. So that is why he will have a second referendum on Brexit. roger, please do not believe all that you hear on the BBC. They are busy helping to push the modern urban myth of full UK employment. We have approx. 1.35million unemployed in the UK. Arguably, we are a million jobs away from full employment. At 1•4 million unemployed in the seventies I was told by my local employment exchange that none of the people on their books were suitable for the four posts that I was desperate to fill because they were work shy and likely to turn up only for one day if at all if I was lucky. And weren’t the Labour Party talking about the right not to work just this week at conference? As I have suggested before, ‘they’ are in a full ‘rapture state’ of trembling anticipation. When reality strikes I hope it strikes them hard – but they are completely delusional at present. 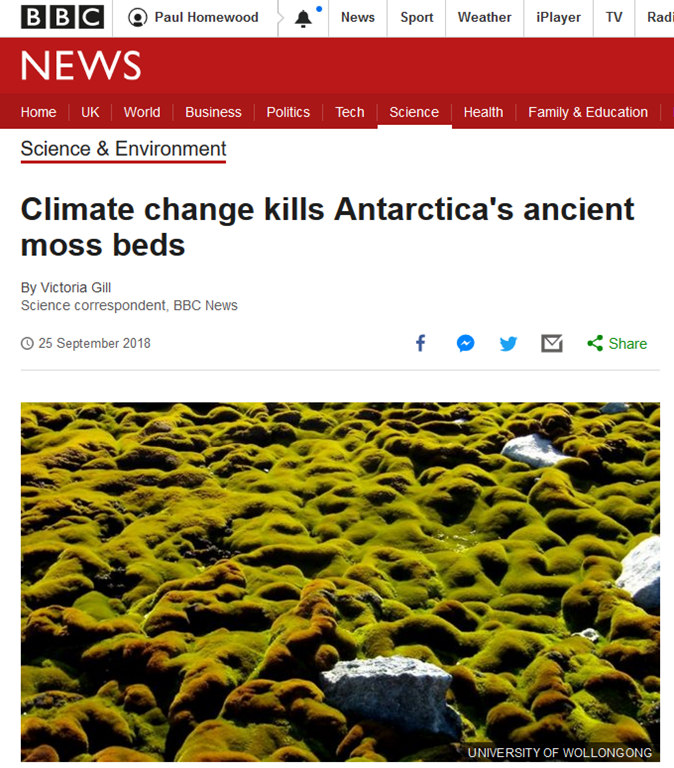 I worked down in the Antarctic and did some research on these moss beds. They are very susceptible to disturbance- such as researchers crawling all over them. A footprint willl last a 100 years. But it ain’t climate change. Which version of ‘climate change’ did this? The article conveniently did not name the “two other species.” In fact it did not give methods, etc. Apparently a picture is worth a thousand words or actual scientific data. The genus, “Schistidium” is a widely dispersed one. The species in question, “Schistidium antarctici” is described as such by Wikipedia: It lives in compact clumps that are yellowish green at the top and brownish black at the bottom. It grows on both soil and rocks. If its habitat supplies ample moisture, it may form a “carpet-like” growth, but if its habitat is dry, it forms a short “cushion-like” growth. Grimmiaceae. As I remember from my one moss identification course, they are rock mosses. We have the family-naming genus, “Grimmia” in WV. Mosses, along with liverworts and hornworts are non-vascular plants in the Division Bryophyta. These are very primitive and thus ancient plants. As such, these groups are able to “roll with the punches.” Mosses are stinkers to identify. Moss experts (bryologists) are few and far between. Nowhere in the somewhat fact-lacking article (I clicked and read the “article”) was Dr. Robinson’s claim to science expounded. Therefore, I doubt that she or anyone else was a bryologist. These sound like ecologists and today that group is fairly devoid of organismal knowledge. They mostly sit at computers and model things to suit their pre-conceived conclusions. I have found Wikipedia remarkably good for plants. It is my go-to for any species in question which is outside the realm of my personal collection of floras. You know the rules – no use of superior knowledge when talking about global warming. You’ll just upset them. I also know the tenets of the Scientific Method. The “rules” about which you speak are non-consequential to science. This does not pass the Scientific Method smell test. Neither does man-caused climate change.